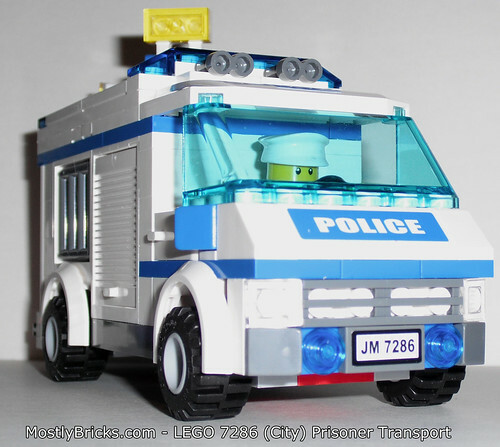 First off, I will go on record by saying that LEGO City has too many police sets, and this one doesn’t help my perception of LEGO City being a safe place to live! I will say that on the other hand, this set is really, really nice. It looks strong and mildly brutish with its boxy design complete with fat fenders to boot. 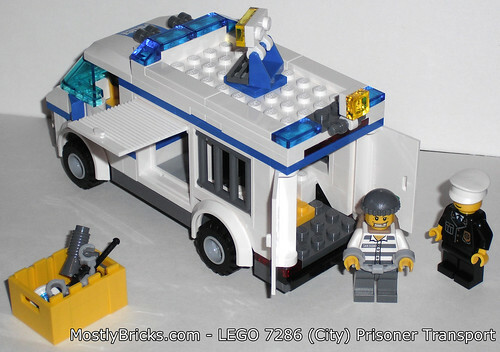 The stats on this formidable van are: 173 pieces, one sticker sheet, one roadblock sign, loads of accessories, one yellow crate to keep them in, a motorcycle, a moneybag backpack, 100 LEGO bucks (which doesn’t seem worth stealing and going to Legoland jail for), one policeman minifig, and one crook minifig. * Target, Toys R Us, etc. The overall build is solid, and is durable enough for most kids to play with. 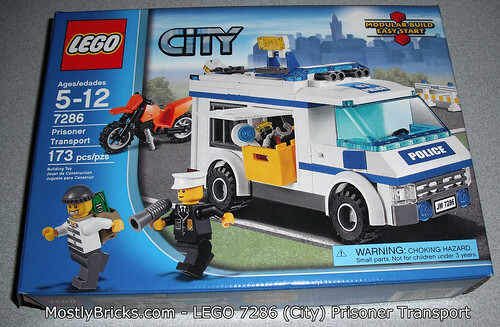 Retailing for $19.99 at both Target and LEGO.com, this set is a true bargain with it’s nice stash of accessories and the cool van. One part that I love is the set of corrugated cargo doors. The only drawback to them was snapping them into the door frames. The first one snapped in fine. The second one, however, gave me a minor fit. There is a way to properly put them in, and you readers who buy this set will see what I’m talking about. The rear of the vehicle has a pair of smooth, white doors which require some sticker placement. Another cool part is the roof. 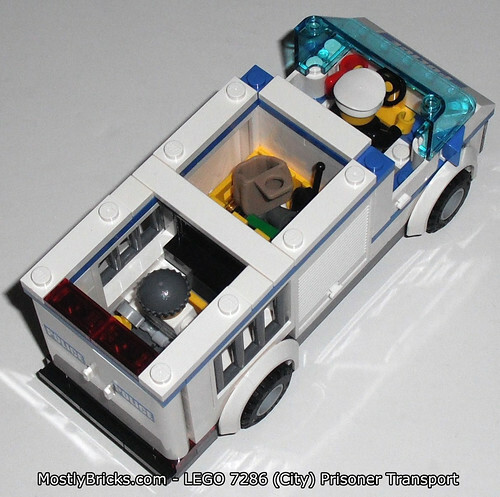 Built in much the same way as the LEGO Beach House and Green Grocer (with their detachable levels), the Prisoner Transport’s roof is easily removable for easy access to the cargo area and the prisoner hold. 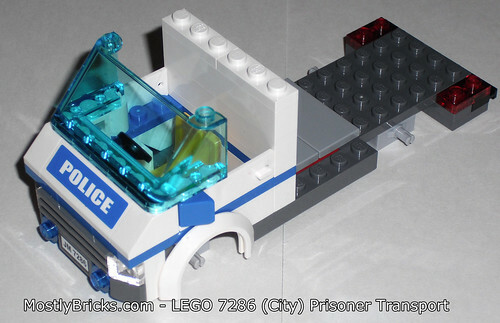 The roof of the front cab can also be lifted off to allow for easy placement and removal of the policeman minifig. Details are abundant, and quite nice. This thing has lights galore complete with a swiveling, roof mounted spotlight. 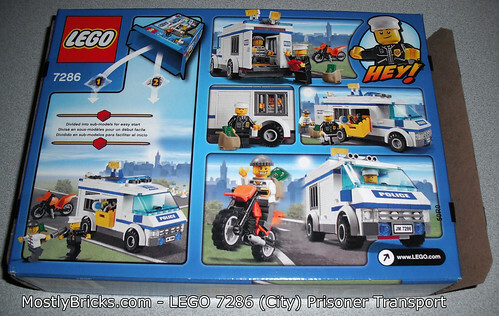 This set also makes nice use of the LEGO binocular parts by using them as a rack of sirens. I love the ruggedness, and the armored truck feel to the completed model. This thing looks like it can flat out barrel through roadblocks without throwing a gasket. The van has a nice heft to it, too. The pieces come in 2 bags. Bag 1 contains all the parts and pieces to build the minifigs, their accessories, the roadblock sign, and the chassis and forward cab. 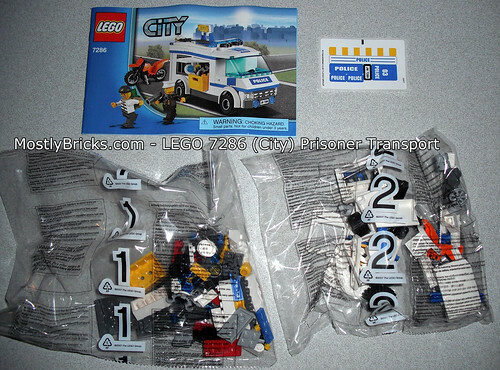 Bag 2 contains everything you need to complete the prisoner hold and the cargo section which the cargo crate easily slides into. The accessories are abundant, as I said before. There is an orange motorcycle much like the one found in the Power Miners Crystal Sweeper set, except this one is detailed with a pair of kickstands for stationary support. 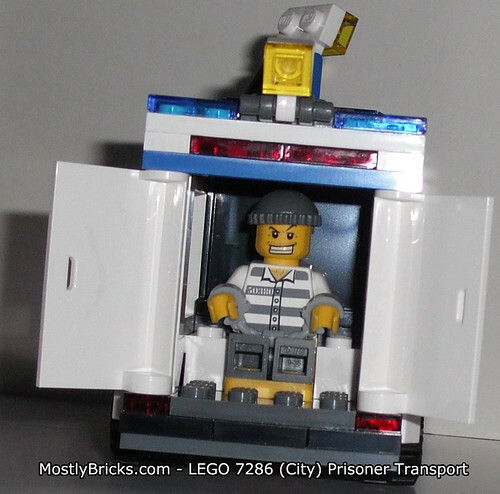 There is a flashlight, 2 pairs of handcuffs, a knapsack (for the crook to wear), a directional paddle, bullhorn, walkie-talkie, red mug, and a nice yellow crate to hold all of it. Oh, and don’t forget the green LEGO 100 dollar piece. The only thing missing is a stereotypical donut. Stickers are not super abundant here, but the ones that are included, do require patience to align them properly. It would be best for and adult to apply these. The recommended ages are 5-12, but ages closer to 12 will have better luck taking the time to put the stickers on correctly. All-in-all, I know kids will love this latest entry. 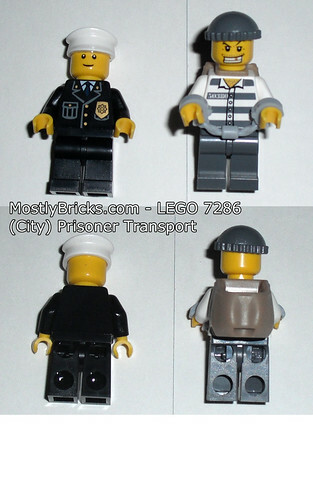 As an adult, I really can appreciate this set, because it’s not one of those cheapie sets that serve as filler in the City Police series. 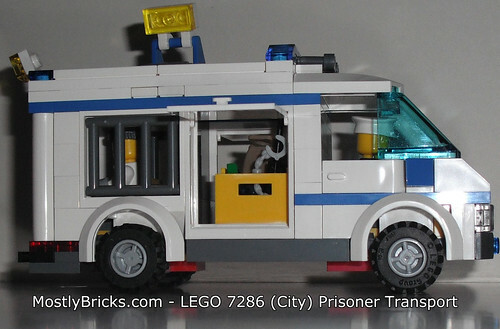 This set brings back memories of my LEGO Police Van (set #6681) from when I was a kid. There’s some nostalgic significance for me. You could say this is the updated version of that set thirty years later. 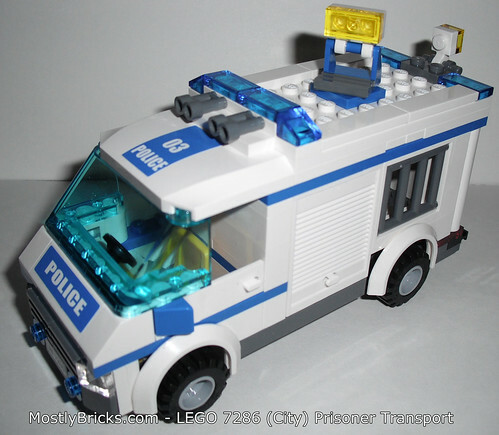 I still have the LEGO Police Van, and will be doing a classic review of it in the near future. 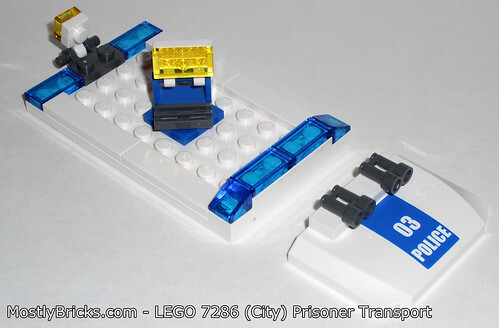 Until then, transporting prisoners will be a little easier in the crime infested world of LEGO City. I’m still a little leery about moving there with all the cops and firemen out in full force; not a very safe place to live. They don’t even have a hospital set in the current lineup!